I have always loved dirt cake. In this one I got to use my Candy Cane Oreos. I don't remember if I bought them at Walmart or Target, but they sure taste good. Don't worry, you'll have a few left over so you can taste them too. I chop mine up in a food processor, but you can place them in a large Ziplock bag and have the kids crush them with a rolling pin. The filling is just a lot of mixing, which can all be done by hand so the kids can help. Have them whisk the pudding mix and milk instead of using a hand mixer. It will help tire them out. Normally I mix 2 cups of milk to make the pudding, but I wanted to add some eggnog. First I tried making the pudding with eggnog, but it didn't take. So on my second try I made the pudding with 1 1/2 cups milk and let it set in the fridge. Once it was set, I added the 1/2 cup eggnog and it came out fine. I think I am single-handedly keeping Wilton in business this holiday season. I can't stop buying their stuff. Tell me these penguins are not adorable. And the North Pole Decorating Kit has everything I need included, the candy cane pole, the sign, and the snow glitter. I found these at Walmart by the way. Before assembling my cones, I just wanted to add one more thing to the poles. I found these holiday Sixlets at the Dollar Tree, they were perfect for the top of the pole. I just glued them on with cookie icing. You can also use red M&Ms if you like. The north pole signs that come with the kit are stickers. I wanted to make them more sturdy, so I stuck them on some white card stock and cut around it to give it a white edge. I glued those on with cookie icing also. If you don't want to buy the kit, you can make your own signs with a paper straw, some white and red card stock and a red glitter pen. You can still glue the Sixlet on top with cookie icing. 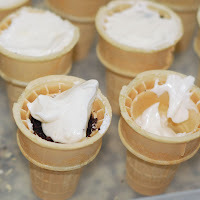 To fill the cones, I started with the crushed Oreos at the bottom, about a tablespoons worth. Then I topped it with a tablespoon of cream filling. Then another layer of Oreos and a final layer of cream filling. I smooth out the top, then it was time for the frosting. For a little extra detail you can use some cookie icing around the rim of the cone to make some icicles before you add the frosting. 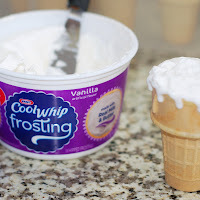 For the frosting, I didn't want anything heavy, so I used Cool Whip frosting. I just spread it on with a spatula. I had these Wilton, white sugar pearls in the pantry so I added them with the other glitter sprinkles to resemble snowballs. Then I added the pole and the penguin. You can eat the filling first with a spoon, then eat the cone or you can just bite into it all at once with no spoon at all. It may be a little messier, but definitely fun! Chop Oreos in a food processor until they become a dirt like consistency or place them in a Ziplock bag and crush them by hand with a rolling pin. Set aside. In a small bowl, mix together the cream cheese, butter and powdered sugar until smooth. Set aside. Once pudding is set, add eggnog and mix well. Then fold whipped topping into the pudding until well blended. Next add cream cheese mixture to pudding mixture and mix until fully incorporated. Place in fridge while you assemble the poles. Unwrap each candy cane pole in the kits. 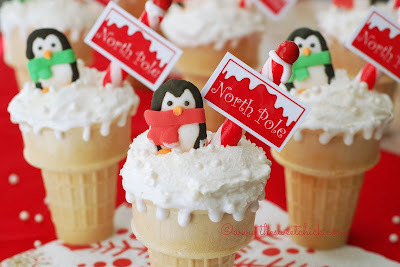 Add a little dab of cookie icing to the tops of the poles and place a red Sixlet on top. Try to place the poles upright until the cookie icing sets. Take each North Pole sticker and adhere it to white cardstock. Cut out by hand, leaving a small white border around each sign. Place a small dab of cookie icing to the back of the cardstock and adhere it to the pole. Place upside down on flat surface until it dries. Set cones on a flat surface. Add 1 tablespoon crushed Oreos to the bottoms of each cone. Then add 1 tablespoon cream filling and another tablespoon of crushed Oreos. Press down slightly with a spoon before adding the final tablespoon of cream filling. Smooth the filling with a spatula before adding the frosting. 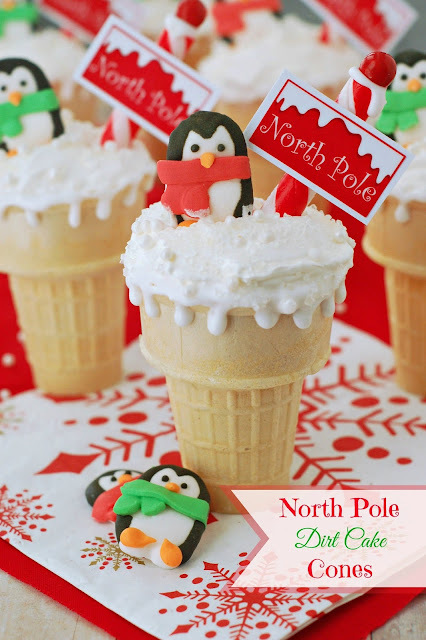 If you want, decorate the tops of each cone with some cookie icing to resemble icicles. 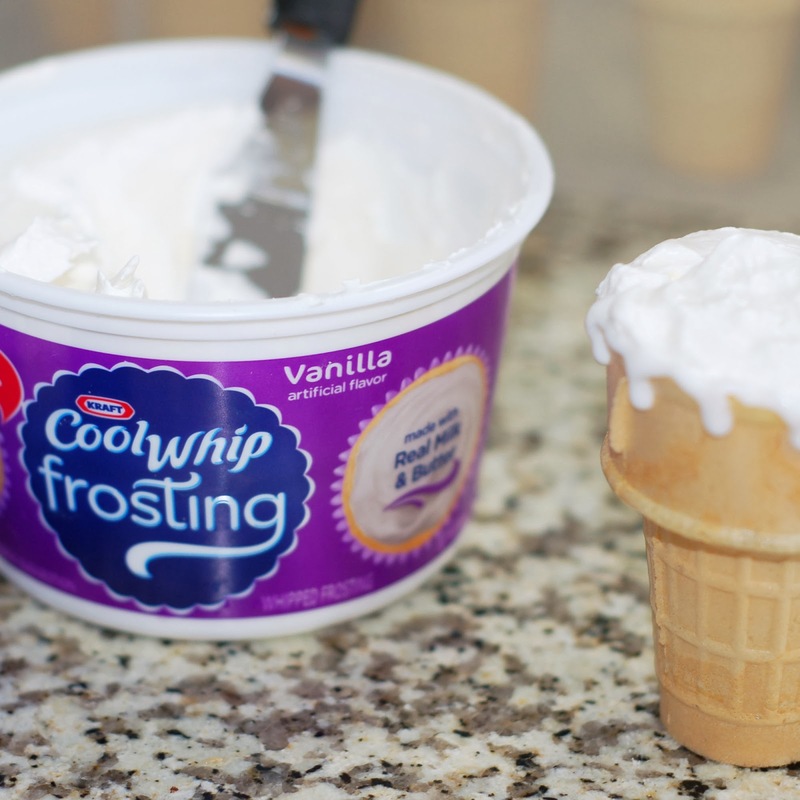 Then with a spatula, frost each cone with the Cool Whip frosting. Sprinkle with the glitter sprinkles included in the kits. If you want you can also add some White Sugar Pearls to resemble snowballs. 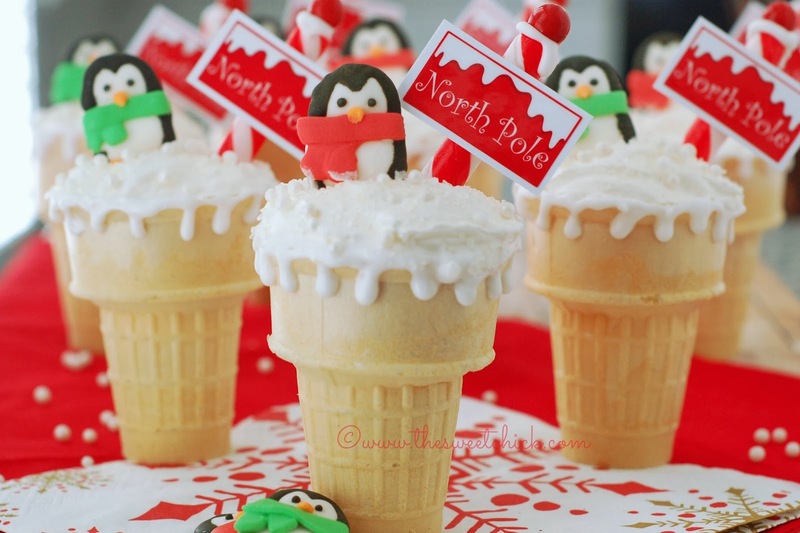 Place a candy cane pole into the tops of each cone. 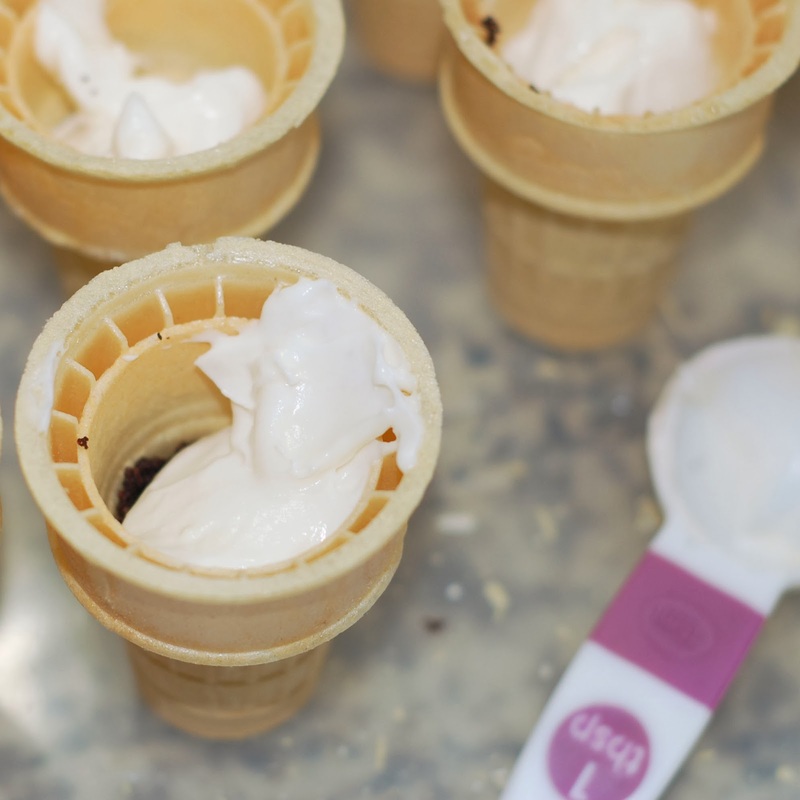 Add a candy penguin to each cone by pressing them gently into the frosting. That's it! You are done. Dig in! You can have all the filing ready to go, but you can't leave it in the cones overnight or the cones will get soggy.